Histoires de Parfums' website informs us that “the mythical tuberose flower is a symbol of desire and dangerous pleasures”. Um, wrong. That would be the mythical vanilla bean cupcake from Red Velvet Cupcakery. But HdP have a trilogy of tuberose perfumes to plug, so I'll let it slide. Everyone “knows” what tuberose smells like: it's a big badonkadonk floral that's cloying if not sent to the same Dominique Ropion Finishing School that Carnal Flower graduated from. Well gosh, maybe the cloying part isn't the tuberose after all, but all the Fracas-style doilies and knick-knacks crowding out the composition. That's what I'm starting to think after wearing Tubéreuse 1, capriciously subtitled Capricious. Tubéreuse 1 doesn't really register as a floral at first. It goes on iris-dry, cloth-y, a little rubbery. It's rubbery in the way that real flowers can be, with all of their “non-pretty” nuances that they sneak into their olfactory output. T1 sweetens slightly, and there's a wonderful thick quality that has the weight of incense, without actually being woody. It's more floral as it develops, but stays at a calm, suntan oil kind of hum. The listed ingredients include groovy stuff like saffron, ylang-ylang and suede, but like all of the Histoires, T1 is a well-integrated composition where individual notes are not brought to your attention. It's not a straggly parade where you can pick out the baton twirlers, fez-wearing shriners on mini mopeds, and suede. T1 doesn't scream “suede”, but I'm enjoying the excuse of looking for it as I sniff deeply of myself. I love Tubéreuse 1! Okay, I sprayed on some Tubéreuse 1 and it's weird. Not bad weird, or maybe even good weird, just weird, like nothing I've ever quite smelled before. It was a little piercing at first, like an urgent knock at the door, the kind that's annoying because you're about to take a nap or watch a movie and somebody suddenly wants something. Now! I don't know what Tubéreuse 1's piercing top-note wanted because I didn't answer the door, and instead peaked through the keyhole for a few minutes and waited for it to go away. Which it did. And then a whole lot of suede showed up, which reminded me of one of those leathery Etat Libres. And yet there was also a floral aspect, not quite as big and heady as your typical tuberose but strong enough to cause a flowery friction with the suede, the combination of which made it more agreeable than, say, Rien, but also more surprising, like a small bunch of flowers popping out of an old briefcase. 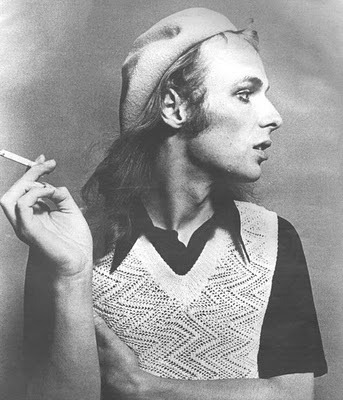 I'm always annoyed when bloggers write that they appreciate certain fragrances but they don't like them, as if all these perfumes are like Brian Eno records, but Tubéreuse 1 sort of is. I appreciate its weirdness but if I owned a full bottle, I might as well stick it right next to my copy of Another Green World. Okay Dan -- one gal's groovy tuberose may indeed be another man's ambient noodlings. But as it happens, Another Green World is one of my favorite wistful, borderline disturbing, yet ultimately uplifting albums. And you might say the same about Tubéreuse 1. When I first tried T1, I liked it a lot, bought a bottle, wore it a few times and then just couldn't get past its weirdness. Sharp, dry, iris-y, rubbery, a teensy bit floral, suede-like, rounded out by an arid, unsweetened cocoa note. And after my initial fascination, I just stopped wearing it. So, I really like your new category. Brian Eno fragrances! The strange and compelling ones that you pull out of your collection once a year when you're in a certain mood, spritz, and enjoy for a few hours, sniffing and contemplating. Dans tes Bras and Stephen Jones are like this for me. Weird, edgy, offbeat, a bit thought-provoking. The latter two may be a bit more David Byrne than Brian Eno though. I really shouldn't buy any of them-fragrances or albums. LOL at "a big badonkadonk floral". That's my new category! Tonight out come the pink cowboy boots - I'm going to play Honkeytonk Badonkadonk and wear Fracas. I'd be interested to hear what you think of Duchaufour's new weird Tuberose, Nuit de Tubereuse. Great post! Have not tried T1, but I'm intrigued. I do love Fracas - on me it's a bit inky and slutty, kind of twisted, really. Of course, I love that. m61, totally agree with putting Dans tes Bras and Stephen Jones in the Eno/Byrne category. Maybe we'll just call them "art rock" perfumes? I like that! kjanicki, that sounds like a fine ol' hootenanny you've got planned there. Funny you should ask my thoughts on Nuit de Tubereuse - I rather impulsively bought a bottle about a month ago and am planning to include it in a "Summer Fragrances" video I'm shooting tonight. Stay tuned! I think I have a sample of this, but since my favorite Eno album is "Before and After Science", I'm seriously wondering if I'll like T1! BF - how funny, I've been listening to "Before and After Science" non-stop since I just got it on CD (I used to have the album). I love "Julie With..."
I love that song (and have been listening to that album a LOT lately too) - so gorgeously melancholy - fits my mood these days! I just sampled Nuit de Tubereuse and I swear I think it reminds me of Givenchy Ysatis that I someone gave me a sample of. Have you tried that one?